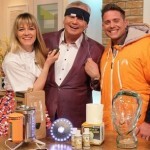 Edith Bowman ,festival veteran joined ITV on “This Morning” to talk about her Festival Guide for 2015. As festival season is fast approaching Edith and Steve Wilson show us some essential festival technology. Which includes the original towel off shampoo and body wash Pits & Bits. Watch the video here !!!!!!!! 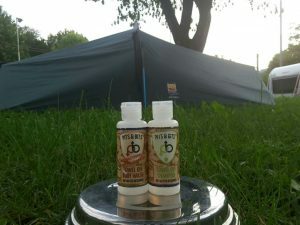 Pits and bits the waterless towel off wash in a bottle. 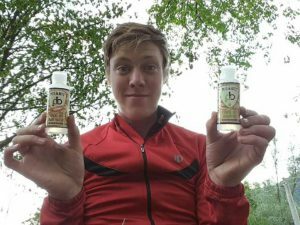 It lays claims to be able clean and moisturise the skin, able to remove dirt, grime, mud and all sorts of nasty stuff that you dont want on your hands after a run. A quick rub of this stuff on your skin suddenly makes you realize that it can easily break down dirt and grime, removing the ground in dirt. Odourless liquid, no stickyness and no after smell like alcohol gels make using this product a pleasant experience. Clean enough to eat your first meal after all that hard work. What pits and bits didn’t know is I’ve actually been using this for a year already. I just bought the stuff as a trial for cleaning up after runs and it works a treat. I’ve been very happy with the results and will carry on using it. 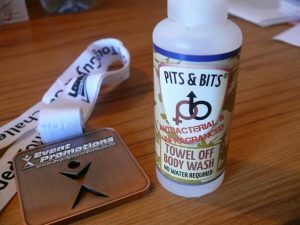 Pits & Bits: Towel Off Body Wash – a waterless cleaning liquid targeted at cleaning yourself off after racing, camping, festivals, or outdoors: “Whatever your pleasure, Pits & Bits will clean you post activity – without water.” Sounds good. 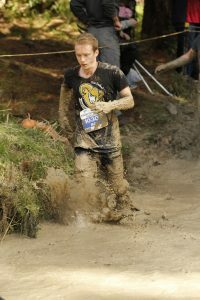 I used a bottle to clean myself off after running the recent Loaded Tough Guy and Gal Challenge in Wellington (a post about this race coming soon). This is the degree to which Tough Guy and Gal Wellington got us muddy… and Pits & Bits cleaned it off perfectly. After the race, we skipped the lines for the showers and headed back to the car. Corinne from Obstacle Racers NZ handed me a small bottle and a small bag. Inside the bag was a dehydrated cloth, one of those ones that magically expands with water like these dinosaur shape things I bought for my son at the $2 store. But unlike the few minutes amusement we got from watching $2 dinosaurs grow, the Pits & Bits bottle saved a lot of hassle. It was fairly easy to use: squirt some on your body where you’re covered in mud, rub it around, and then towel it off – along with the mud. By the time I finished the race and gotten to the car, all the mud on my arms and legs had dried and caked over, so I used about 5/6s of a bottle for most of my body, only doing the dirty bits (and perhaps not all my pits and bits), and surprisingly it really was a waterless shower. The liquid foamed up and wiped away the mud with it. I was given the ‘antibacteral and antifragranced’ version, and it didn’t leave the skin sticky or scented. While the liquid in the bottle itself was water free, as the label proclaims, water was required to squirt on the magic cloth to expand it for use. Although, using their cloth really isn’t required if you have your own towel or rag handy. No doubt there’s some soapy chemical mutations going on in the mixture to cut through dirt, and my skin often flares up in life…. But in this case the Pits & Bits seemed fine on my skin without irritating it. More uses may be required though to see if it does have an effect in my case. Pits & Bits is paraben and alcohol free, and the pH has been designed to match that of healthy skin. While I wouldn’t use Pits & Bits to replace a whole shower (I’m still going to jump under warm water to relax once I get home from a mud run), it definitely conveniently and quickly removed mud after charging through it on the obstacle field. While going camping, or perhaps just when I’ve been jumping around in a park and then have to look presentable again for work, Pits & Bits will be very useful.